Nepal Oil Corporation (NOC) announce vacancy notice every year for various posts. 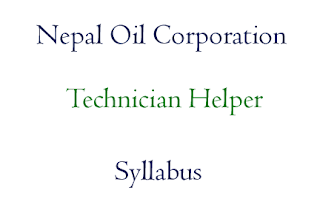 Here is Nepal Oil Corporation Syllabus: Technician Helper that needed to prepare Nepal Oil Corporation's Technician Helper post. Check online preview of Nepal Oil Corporation Technician Helper Syllabus with download link below.